Androgenic hair loss has three causative factors: genetic predisposition, the presence of the hormone dihydrotestosterone and the age of the patient. 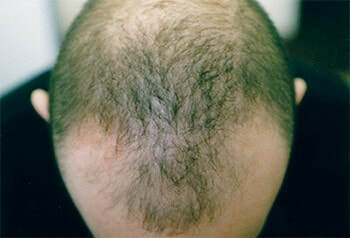 Male pattern baldness can be inherited from either the fathers or mothers side of the family. At puberty, more of the male hormone testosterone circulates around the body causing hairs that are genetically programmed (in the pattern areas) to produce finer and shorter hairs with each new cycle of hair growth. Testosterone reaches the target organ, in this case the hair follicle, where the enzyme 5α-reductase changes testosterone into the highly potent hormone di-hydro testosterone, which causes the above effects.